Hands up if you thought 'wedding nails' just meant a French mani and a quick blast under the nail dryer? Well think again. Gone are the days of the classic pink and white – rejoice in sprucing up your ring finger for those all-important wedding snaps or show off a stunning set of nails to set off that sparkler. We’ve asked Helena Biggs, deputy editor at Scratch magazine, for her must-try wedding nail art ideas. It’ll work well with: Girly dresses with lashing of lace or exuberant trains. Match it to your bridal bouquet or your bridesmaid’s dresses to make your colour scheme really pop. Why we love it: Feminine and delicate, pink looks pretty on all fingertips and glitter will really catch the light in photos. How you can do it: Paint two thin coats of a pale pink shade and when dry, coat it two shades of a chunky pink glitter – Orly’s Embrace is ideal with its dusky pink holographic particles. Build up the coats of glitter until you’re happy with the coverage. It’ll work well with: Crisp white dresses with pearly detailing around the neckline and down the train. It’s also ideal for a vintage style celebration. Why we love it: It highlights the all-important ring finger but also maintains a classic feel. Understated elegance comes to mind. How you can do it: Pick up some little pearls from your local haberdashers’ and, using nail glue, stick them in your chosen pattern on your existing French mani. It’ll work well with: 50’s style dresses with a kick pleat or A-line, and a hot red colour scheme. Add a lick of red lippy to complement. Why we love it: It’s cute, it’s fun and it draws attention – what more could a bride want? How you can do it: Paint two thin coats of a stunning scarlet shade onto nails – we love Essie’s Long Stem Roses – and grab a dotting tool or a cocktail stick with a small blob of blue tack on the end. 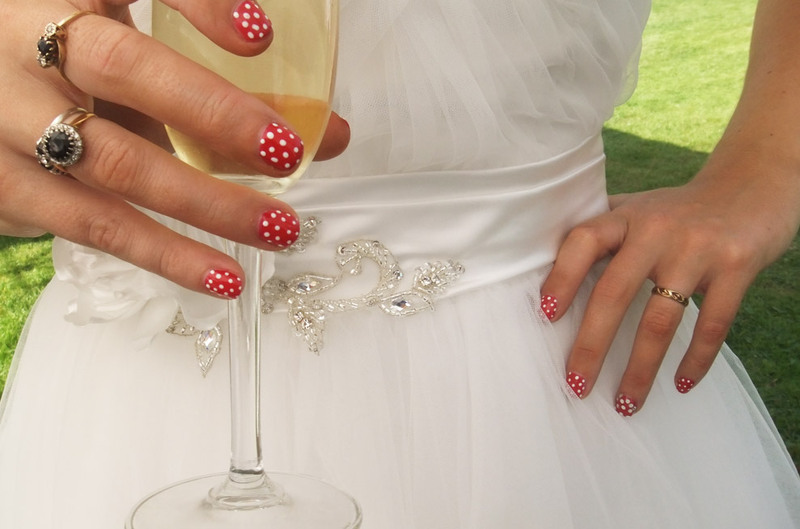 Dip into white polish and create a random dotted pattern on each nail. Wait to dry and seal with a top coat. It’ll work well with: Simple, classic dresses or gold and cream bridal saris. Why we love it: Easy, quick and oh-so striking, these nails offer an instant wow factor and look fab in photos with the all-important ring. What’s more, you can simply stick on and remove for the honeymoon if you wish. How you can do it: You can attempt a DIY jobby with pearls, gold buillions and nail glue, but we found it much easier to buy a pack of Nazila Love Glamour Nail Glitz from River Island. Simply stick the designs to your own – freshly buffed – natural nails and voilà – instant art! 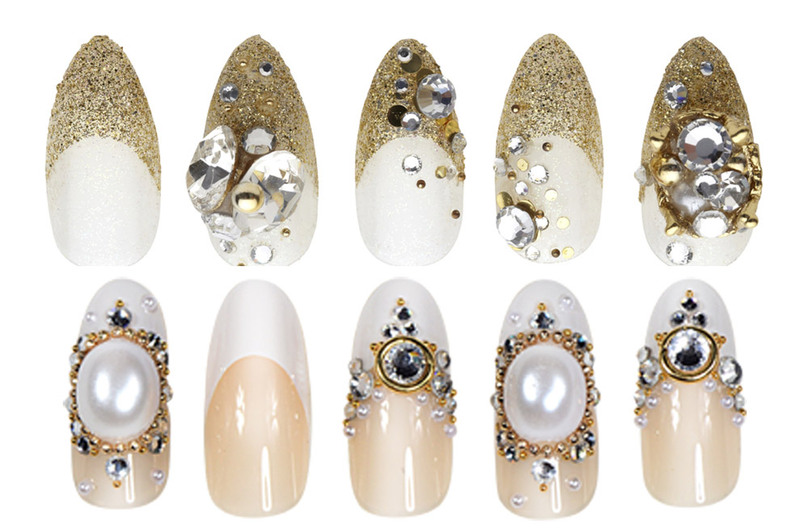 Nail Glitz in French Glam and Gold Carat from Nazila Love Glamour, £14.99 per pack. It’ll work well with: Sleek, plain and satin dresses with an added touch of sparkle. Why we love it: Subtle and elegant, a handpainted design adds a lick of colour to an all-white ensemble and the shade can be altered to suit any scheme. How you can do it: Paint two coats of a shimmery white shade – try Platinum Pearl from China Glaze – and allow to dry. The tricky bit is the design, and if you master one hand, chances are you’ll find the other one a little tricky. So, try and get an artistic friend to help out with a thin brush and your chosen nail shade. Create a flowery design or swirls of choice and add one or two dabs of nail glue around the design to secure some diamantés for a little sparkle.